DreamServer Review 2019: Is DreamServer a Good Hosting? 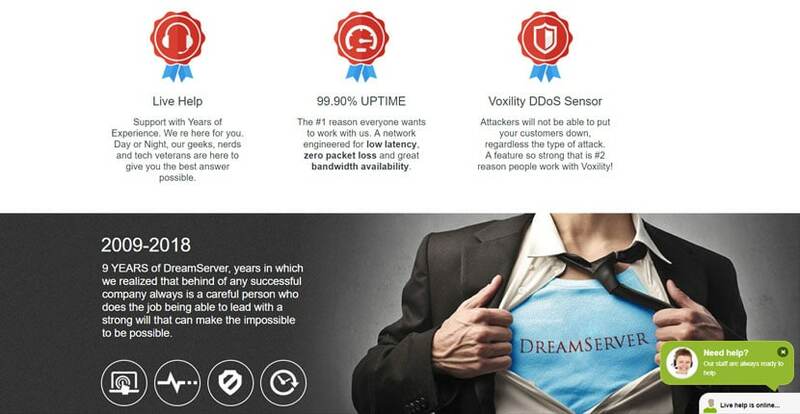 DreamServer is a Romanian web hosting provider with a 100% uptime SLA and scalable hosting solutions. It offers Voxility anti-DDoS protection and support for advanced programming languages. Founded in 2009, DreamServer is a Romanian web hosting provider offering shared, VDS, VPS, dedicated, radio, and game hosting services. Its servers are located in Romania. While the main website is in English, DreamServer’s services and support are also available in Russian and Romanian. Interestingly, while DreamServer advertises a 99.9% uptime guarantee, a closer look at the Service Level Agreement (SLA) reveals that the company offers credit when 100% uptime levels are not met. The caveat is that downtime is only measured from the moment you open a support ticket, which means you’ll have to keep track of your website closely and send in a ticket as soon as your website goes down. DreamServer also uses superior technologies available in the market today, such as the CloudLinux OS, CageFS file system, OptimumCache, and MySQL Governor. All this means is that you’ll have above-average security and performance for your website. DreamServer also supports advanced scripting languages such as Ruby and Python. However, one downside is that it only offers PHP support up to version 5.6, so your PHP scripts may be noticeably slower than the norm. DreamServer’s prices are fair for what you get. These packages certainly aren’t the cheapest, but you can host multiple domains even on the entry-level plan. Unlike most of the competition, DreamServer also features a performance credit clause in its SLA: you’re entitled to a refund of 5% of your monthly hosting fees for every 30-minute downtime interval your website goes through. Other than that, though, there isn’t a money-back guarantee. DreamServer only has monthly billing terms available. This is both good and bad: you won’t be tied down with long contracts, but you also won’t be entitled to any discounts if you’d prefer to stay with DreamServer for the foreseeable future. The company offers a three-month free trial of its web hosting services, but it appears that there’s limited availability for these slots, so you’ll have to check back from time to time. Available support channels include live chat, email, and phone. 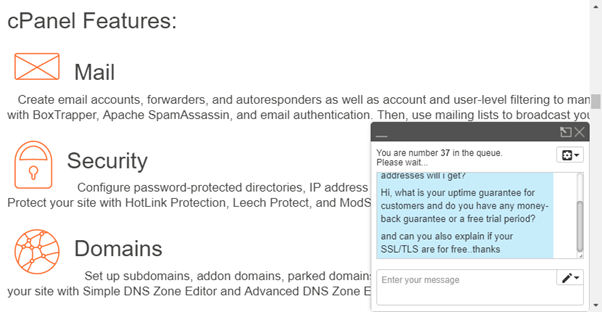 To my surprise, when I tried to connect with them over live chat, I was told that I was number 37 in the queue. After waiting a number of hours for my turn, I finally gave up. DreamServer provides great hosting plans that cater to individuals, small businesses, and even large corporations. However, support is below average, so if you need highly responsive and dedicated support staff, you’ll have to look elsewhere. Wondering how DreamServer stacks up against other Web Hosting companies? Enter any other Web Hosting company and we will give you a side-by-side comparison.